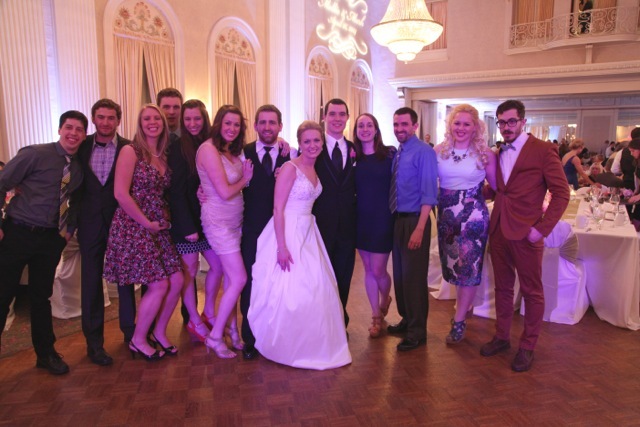 In May we attended Mark and Mollie’s beautiful wedding. After dinner and shortly after the dancing started my friend Colleen came up to me and said, “Whenever you want to dance let me know and I will wheel you out on the dance floor.” I politely told her no because I was feeling a little self-conscience about my current state and besides the dance floor was way too crowded for me and my wheelchair. About half an hour later Colleen’s husband Chip came up to me and whispered into my ear, “Rosemary, I can see in your eyes that you are out on the dance floor dancing right now.” Then he gave me a note on a tiny piece of paper that said, “I love you for many reasons but right now I love you for your smile.” I guess Chip could see how lost I really felt and decided to take action in his gentle Chip way. As I was thinking about Colleen’s dance offer and Chip’s precious note my friend Terri came up and asked me if I wanted to dance and I said “Yes.” Terri found room on the dance floor for me and I made no more excuses the rest of the night. Sometimes I can be my biggest enemy by talking myself out of doing something because I may look silly doing it or it may be out of the ordinary. But I’m so glad that the people in my life see no boundaries for me. Remember the words in a song “If you get the chance to sit it out or dance, I hope you dance”! I believe you told me that was one of Mick’s favorites. Good choice for so many reasons. Yes, your heart, eyes and body says dance…so go dance and enjoy it. We dance too when you dance! keep on dancing. . . . . .